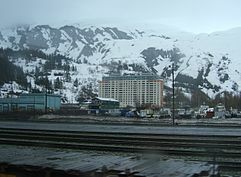 Whittier is a city at the head of the Passage Canal in the U.S. state of Alaska, about 58 miles (93 km) southeast of Anchorage. The city is within the Valdez–Cordova Census Area. At the 2010 census the population was 220, up from 182 in 2000. The 2016 estimate was 214 people, almost all of whom live in a single building. 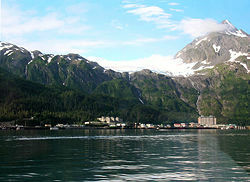 Whittier is also a port for the Alaska Marine Highway. On March 28, 1964, Whittier suffered over $10 million worth of damage in what became known as the Good Friday earthquake. As of 2019, the earthquake remains the largest U.S. earthquake, measuring 9.2 on the moment magnitude scale, and having caused tsunamis along the West Coast of the U.S. The tsunami that hit Whittier reached a height of 13 m (43 ft) and killed 13 people. Whittier is located at 60°46′27″N 148°40′40″W﻿ / ﻿60.77417°N 148.67778°W﻿ / 60.77417; -148.67778 (60.774174, −148.677649). The only land access is through the Anton Anderson Memorial Tunnel, a mixed-use road and rail tunnel. The town is on the northeast shore of the Kenai Peninsula, at the head of Passage Canal, on the west side of Prince William Sound. 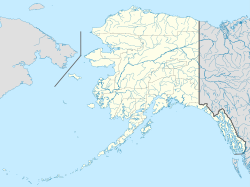 It is 58 miles (93 kilometres) southeast of Anchorage. According to the United States Census Bureau, the city has a total area of 19.7 square miles (51 km2), of which, 12.5 square miles (32 km2) of it is land and 7.2 square miles (19 km2) of it (36.36%) is water. Whittier has a subarctic climate (Dfc) under the Köppen climate classification; and has an annual precipitation of 197.8 inches (5,024.12 mm). It is the wettest city in Alaska and the United States, receiving significantly more annual precipitation than Yakutat and Ketchikan which are the second- and third-wettest cities in Alaska, respectively. Whittier is located at the northern tip of the northernmost temperate rainforest. Whittier first appeared on the 1950 U.S. Census as an unincorporated village. It formally incorporated in 1969. As of 2015, there were 214 people living in the city, with 288 available housing units. Almost the entirety of this population lives within the 14-story Begich Towers. The racial makeup of the city was 78.38% White, 4.05% Asian, 4.96% Native American, 3.60% Hawaiian or Pacific Islander, 5.41% Hispanic, and 9.01% from two or more races. There are 124 households in the town and the average household size is roughly 1.79 people, according to 2014 statistics. Of these households, 56 are family and 68 are non family. 40.30% of the population is married, and 32.34% are divorced. 51.78% of the population has children. The age distribution within the city shows that 13.96 percent of the population is under the age of 18, 3.15 percent is between the ages of 18 and 24, 23.87 percent is between the ages of 25 to 44, 52.25 percent is between the ages of 45 and 64, and 6.76 percent of the population is above the age of 65. The median income for a household in the city was $46,250 in 2014. The per capita income for the city was $31,624. Unemployment in Whittier was at a rate of 9.2 percent. City government consists of a seven-member council with a mayor and six members representing seats (A to G). Whittier Police Department is the main police force in the community. The department was founded in 1974 by Chief of Police Gordon Whittier and two officers, and retains the same level of permanent staff today, although in summer, temporary officers are hired when the town has many tourists. The office is in a one-room unit located on the first floor of the Begich Towers. The station has no place to hold or interrogate people. Whittier Fire Department is a volunteer fire and rescue service with mutual aid from neighboring departments. There is a harbor and a deepwater port used by cruise ships and the Alaska Marine Highway. Whittier Airport (PAWR) is an airfield with one aircraft runway designated 4/22 (formerly 3/21) with a gravel surface measuring 1,480 by 60 feet (451 by 18 m). There are no other facilities and the runway is not maintained in winter. For the 12-month period ending December 31, 2005, the airport had 700 aircraft operations, an average of 58 per month: 97 percent general aviation and 3 percent air taxi. At that time there were two single-engine aircraft based at this airport. The runway was 500 feet (150 m) longer but was damaged by the 1964 Good Friday earthquake. The city also operates a seaplane dock. Known by locals as the Whittier tunnel or the Portage tunnel, the Anton Anderson Memorial Tunnel is a tunnel through Maynard Mountain. It links the Seward Highway south of Anchorage with Whittier and is the only land access to the town. It is part of the Portage Glacier Highway and at 13,300 feet (4,100 m), is the second-longest highway tunnel, and longest combined rail and highway tunnel in North America. 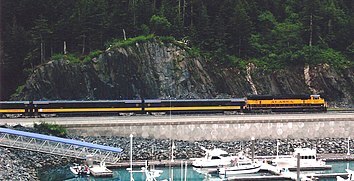 Whittier is Alaska Rail ARRC's connection to the rail systems in Canada and the lower 48 states (by way of rail barge). ^ 1996 Alaska Municipal Officials Directory. Juneau: Alaska Municipal League/Alaska Department of Community and Regional Affairs. January 1996. p. 161. ^ 2015 Alaska Municipal Officials Directory. Juneau: Alaska Municipal League. 2015. p. 165. ^ a b c "City of Whittier, Alaska". Whittier, Alaska. Retrieved 5 June 2016. ^ "Whittier city, Alaska". American FactFinder; US Census Bureau. Retrieved 18 May 2015. ^ "Alaska Marine Highway System: Route Guide". Alaska Marine Highway System. Retrieved 5 June 2016. ^ "Whittier History". Cruise Port Insider. CruisePortInsider.com. Retrieved 5 June 2016. ^ "Port of Whittier". World Port Source. Retrieved 5 June 2016. ^ "The History and Military Significance of Whittier, Alaska". Archived from the original on 4 January 2015. Retrieved 8 January 2015. ^ "The History and Military Significane of Whittier". Archived from the original on 4 January 2015. ^ Durand, Patrick. "The History and Military Significance of Whittier, Alaska" (PDF). Retrieved 5 June 2016. ^ "Surge Wave Produced By 1964 Alaska Earthquake". March 28, 1964 Prince William Sound USA earthquake and tsunami. National Oceanic and Atmospheric Administration. Archived from the original on 2016-08-03. Retrieved 6 June 2016. ^ "Accomplishments". Anton Anderson Memorial Tunnel. Alaska Department of Transportation & Public Facilities. Retrieved 6 June 2016. ^ "One-Way Cruises From Anchorage to Vancouver". Princess Cruises. Retrieved 6 June 2016. ^ Blair, Daniel. "Letter from the Mayor". Whittier, Alaska. Retrieved 6 June 2016. ^ "Announcements". Greater Whittier Chamber of Commerce. City of Whittier. Retrieved 6 June 2016. ^ "Whittier Community School". Alaska Department of Education & Early Development. Retrieved 6 June 2016. ^ "Search Results". United States Census Bureau. Retrieved 6 June 2016. ^ "Around the Nation: Welcome To Whittier, Alaska, A Community Under One Roof". NPR. 18 January 2015. Retrieved 1 January 2016. ^ a b c "Whittier, Alaska People". Sperling: Best Places. Retrieved 6 June 2016. ^ "Whittier, Alaska Economy". Sperling's: Best Places. Retrieved 6 June 2016. ^ Sundog Media. "Mayor, Council & Commissions - City of Whittier, Alaska - Gateway to Prince William Sound". ^ ASCG Incorporated (26 September 2005). "Comprehensive Plan Update 2005" (PDF). WhittierAlaska.gov. City of Whittier. Retrieved 18 June 2017. ^ Sundog Media. "Department of Public Safety - City of Whittier, Alaska - Gateway to Prince William Sound". ^ "Whittier Harbor". City of Whittier, Alaska. Retrieved 6 June 2016. ^ "AirNav: PAWR - Whittier Airport". ^ FAA Airport Master Record for IEM (Form 5010 PDF), effective 2 July 2009. ^ "Welcome to our New Website, Department of Commerce, Community, and Economic Development". Archived from the original on 2009-10-06. ^ ©Alaska Department of Transportation and Public Facilities, all rights reserved. "Whittier Tunnel, Transportation & Public Facilities, State of Alaska". Retrieved 8 January 2015. 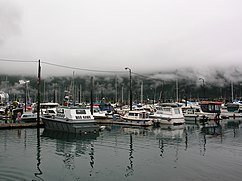 Wikimedia Commons has media related to Whittier, Alaska.